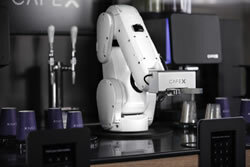 Cafe X Technologies introduces the specialty coffee experience of the future with the launch of Robotic Coffeebar 2.0 at One Bush Plaza in the Financial District. Combining the best in specialty coffee with advanced automation and premium design, customers at Cafe X’s newest location will enjoy espresso-based beverages, nitrogen infused cold brew, and more, all without the long lines and inconsistencies of traditional cafés. Cafe X at One Bush Plaza will offer coffee from award winning specialty roasters: Intelligentsia Coffee, Ritual Coffee Roasters, and Equator Coffees. “Cafe X has disrupted the automated coffee space, moving beyond the tired paradigm of capsules and pods with a radical vision that marries an unwavering commitment to quality with technological innovation,” says Michael Sheridan, Director of Sourcing & Shared Value at Intelligentsia Coffee. While the robot consistently handles drink production, Cafe X is able to provide a true third wave coffee experience for customers through their Product Specialists, passionate coffee experts who work on-site, to provide excellent customer service and coffee education. “We are demonstrating that it is possible to have a much better customer experience when robots and humans work together,” says Sam Blum, Community Manager at Cafe X. Customers can order from the Cafe X app and from kiosks located at One Bush Street. The latest update to Cafe X’s digital ordering experience features animations created by Y Media Labs. “There’s a sense of wonder when you first see the robot arm deliver your coffee and then wave at you. We wanted to bring that same sense of delight to customers in their digital ordering experience,” says Chris Chang, Senior Designer at Y Media Labs. In response to global demand for Cafe X, the company is currently expanding its in-house manufacturing operations in the Bay Area. Additional Robotic Coffeebar units will be available for deployment in commercial real estate and other highly trafficked areas starting from the middle of 2018. Based in San Francisco, Cafe X designs, manufactures, and operates Robotic Coffeebars that serve specialty coffee from local roasters. Cafe X’s San Francisco locations are at 578 Market Street and Metreon. Its third location with the new second generation machine is located at One Bush Plaza. Cafe X Technologies is a privately backed company with funding from Khosla Ventures, Social Capital, LAUNCH, Felicis Ventures, Silicon Valley Bank and The Thiel Foundation.